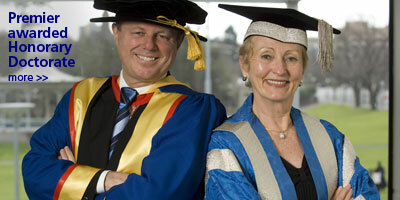 My university has bestowed an honours doctorate on the current South Australian premier, Dr Mike Rann. In the two party preferred system I easily vote Labor over Liberal, and if votes are anything to go by he's Australia's favourite Labor leader at the moment. Good on ya doc :D! UniSA has honoured Premier Mike Rann’s contribution to the establishment of the University by awarding him the title of Honorary Doctor of the University of South Australia this week. The award was presented at the morning graduation ceremony on August 18 at the Festival Centre. Professor Bradley said Premier Rann’s commitment to education as a key strategy in developing Adelaide as a creative, vibrant and successful community has been enduring.